Our Daily Bread Soup Kitchen Inc. is a registered charitable organization that operates as a mission for the community of Selkirk. It is supported by many Churches and Businesses from Selkirk and the Interlake. 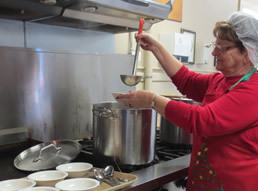 You can support the Soup Kitchen financially. Donate online by clicking on Donate Now. Donations of $20.00 or more are issued a tax reciept. When you plan your garden in Spring, plan to grow some vegetables for the soup kitchen. Donations of fresh, clean vegetables are always greatly appreciated.